CAPE CANAVERAL, Fla. - A patched-up Atlantis blasted off with seven astronauts Friday on the first space shuttle flight of 2007, putting NASA back on track after a run of bad luck and scandal that included a damaging hailstorm and a lurid love triangle. Its big orange fuel tank covered with white blotches where the foam insulation had been repaired, the spaceship rose from its seaside launch pad with a roar and climbed into a clear and still-brightly lit sky at 7:38 p.m. EDT, setting a course for the international space station. The countdown was nearly flawless, but it appeared that something fell from the tank more than two minutes into the ascent, just a few seconds after the solid rocket boosters separated from Atlantis. NASA officials didn't immediately comment on what it was. Falling debris from the tank poses the most danger to the shuttle from liftoff to that point in the ascent. The shuttle smoothly settled into orbit around the Earth. During the 11-day flight, Atlantis' astronauts will deliver a new segment and a pair of solar panels to the orbiting outpost. They will also swap out a member of the space station's crew. The mission had been delayed for three months after a freak storm at the launch pad hurled golf-ball-size hail at Atlantis' 154-foot fuel tank, putting thousands of pockmarks in its vital insulating foam and one of the orbiter's wings. "It took us a while to get to this point, but the ship is in great shape," launch director Mike Leinbach said just before liftoff. Over the past few months, NASA has also seen the arrest of astronaut Lisa Nowak in an alleged plot to kidnap her rival for a shuttle pilot's affections; a murder-suicide at the Johnson Space Center in Houston; and the derailment of a train carrying rocket-booster segments for future shuttle launches. More recently, NASA Administrator Michael Griffin has come under fire for suggesting that global warming may not be a problem worth wrestling with. "We've had a tough six months for a number of different reasons," Griffin told The Associated Press hours before the liftoff. "We'd love to have a textbook launch and a textbook mission. It would just make everybody feel good." NASA has not had a shuttle launch since December. After the hailstorm, Atlantis was rolled back to the hangar, and the space agency decided to sand down and patch the gouge marks with foam rather than swap out the entire tank. The foam has been of paramount concern to NASA ever since the Columbia disaster in 2003, when a chunk of the insulating material broke off during liftoff and gashed a wing, allowing fiery gases to penetrate the shuttle during its return to Earth. All seven astronauts aboard were killed. Although the top of the tank Friday looked like a beat-up old car that had undergone bodywork in someone's garage, officials said it was safe. "We have done extensive tests and analysis," said LeRoy Cain, launch integration manager. There was no immediate word from NASA on whether any dangerous pieces of foam fell off the tank during the ascent. 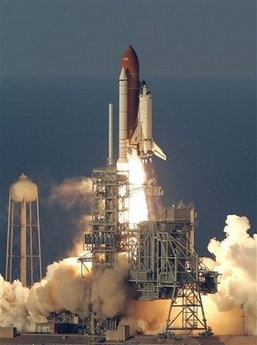 The hailstorm forced NASA to reduce the number of shuttle missions in 2007 from five to four. The space agency hopes to fly at least 12 construction missions besides this one to the space station, and also plans to send a crew to repair the Hubble Space Telescope before the shuttle fleet is retired in 2010. Atlantis' crew is led by commander Rick Sturckow. The other members are pilot Lee Archambault and mission specialists Patrick Forrester, Steven Swanson, Danny Olivas, James Reilly and Clayton Anderson. It is the first all-male crew at launch since 2002. Anderson will replace astronaut Sunita Williams as the US representative aboard the space station, and Williams will return to Earth aboard Atlantis. She has spent the past six months in orbit. Two astronauts will not be assisting in the launch as previously planned. Nowak had been assigned to the ground team that communicates with the astronauts in flight. But she was fired by NASA in March, a month after her arrest. And the object of her affections, Bill Oefelein, had been scheduled to fly a weather plane at a shuttle emergency landing site in Europe. But he was dropped from the astronaut corps this month and returned to the Navy.